Letter from the E. of Northumberland. Dowager Lady Campden's Thanks for her Privilege, and will contribute 300l. Gibbon, Leave to attend the Committee on Sir Thomas Dawes's Bill. Lady Capell, a Protection, and her Horses, &c. to be restored. Message to the H. C. for a Conference on a Letter from the E. of Northumberland. Bickerslaff and Henn, a Pass. Wiseman, a Pass to Holland. Sir Lionel Tallemach, a Pass to France. Message from the H. C. about a Conference on the Letter from the Committee at Oxford; and to send away the Capuchins. E. of Westmorland to confine himself to His House. Master of the Wards to take the Wardship of Mrs. Roper's Son from her. Report of the Conference about Letters from Oxford. Sir Thomas Cary versus Bp. of Ardagh. Saltilion, a Pass to France. 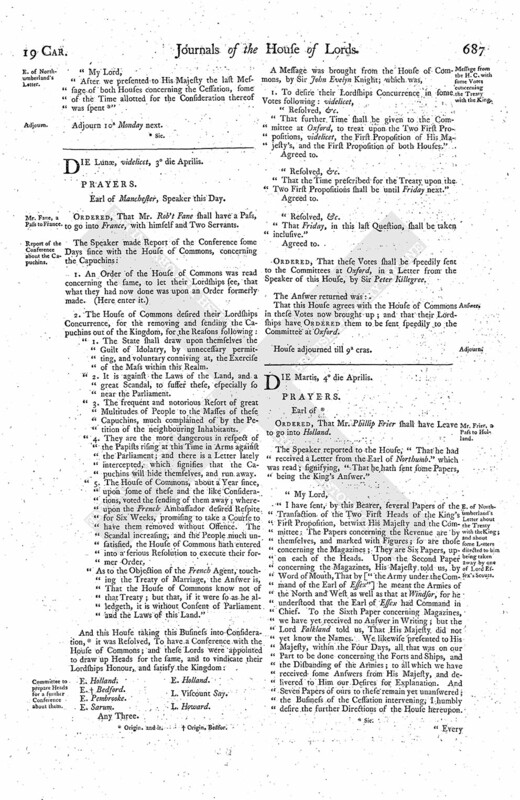 Gibbon's Petition for Leave to attend Sir Thomas Dawes's Bill. Earl Manchester, Speaker this Day. Thanks was humbly presented to this House from the Lady Elizabeth Viscountess Dowager Campden, for affording her the due Privilege as a Peer's Widow; and that she will voluntarily send in Three Hundred Pounds for the Parliament's Use, as hath been demanded of her, if this House will please to appoint whither it shall be sent: Whereupon this House did direct that she should send it into Guildhall, London, as soon as conveniently she could. Whereupon it is Ordered, &c. That the Warden of The Fleete shall permit him, with his Keeper, to come to the Committee for the Creditors Bill against Sir Thomas Dawes, and to go to the Referees and his Counsel, so that he return at Night to (fn. 1) The Fleete. The House was this Day informed, "That the Lady Capell hath had her Horses and Four Hundred Pounds taken from her by some Soldiers, under Pretence of a Warrant from the Committee of the Safety, wherein the Parties have exceeded their Commission, and injured the Committee:" Whereupon it was the Resolution of the House, That the said Committee should make Enquiry thereof: And it is Ordered, That the said Lady shall have a Protection, for her Houses of Haddon Hall and Cashuberrey, in the County of Harteford, for her Goods and Chattels thereunto belonging; and that the Earl of Manchester, Speaker, should write to the Lord Grey in her Behalf. That the Lords desire a present Conference, touching a Letter received from the Earl of Northumberland. The Messengers brought Word, "That they would speedily return an Answer by Messengers of their own." Ordered, For a Pass to be granted to Mr. James Hamilton, Servant to Marquis Hamilton, to Oxon and back. Ordered, That Mr. Howard Bickerstaffe and Mr. Hugh Henn, with Two Servants, Four Horses, and Apparel, shall have a Pass, to Oxon and back. Ordered, That John Wiseman shall have a Pass into Holland, with Two Servants. Ordered, That Sir Lionell Tallemach, Baronet, shall have a Pass into France, with Two Servants. That the Commons will give their Lordships a present Conference, touching the Earl of Northumberland's Letter, as is desired; and then they desire that they may communicate a Letter that they have received from their Committees at Oxon also; and lastly, that they will concur with them in the sending away of the Capuchin Friars. The Commons withdrawing, were called in again, and answered by the Speaker, "That the Lords will meet presently; and that, touching the Capuchins, they will return an Answer by Messengers of their own." Ordered, That the Earl of Westmerland, a Prisoner in The Tower, shall be delivered to the Gentleman Usher of this House, to be first carried to the Earl of Manchester, who is to promise upon his Honour unto the said Earl of Manchester, that he will be a true Prisoner in his House at St. Bartholmew's, and to return to The Tower of London when this House shall direct. Ordered, That Mr. Ellis shall have a Pass, to Oxon and back. Ordered, That Mr. John Watson shall have a Pass, to Gloucester and back, with Two Servants and Three Horses. Ordered, That Mr. John Bacon shall have a Pass, to send down Servants and Horses to Norwich; and for his Family to come up without Search. Upon the reading of the said Petition of Mr. Henry Noell, Second Son of the late Lord Viscount Campden; shewing, "That the Committee of Lincolne had not obeyed an Order of this House, dated the 15th of March last:" It is Ordered, That the said Committee and all others shall obey the said Order in all Points. The House was this Day informed, "That Mrs. Roper (being a Recusant Convict) hath the Wardship of her Son, by whose Means the said Ward may be sent beyond Seas, and bred a Papist:" It is Ordered, &c. That the Master of the Wards shall send for him, and place him in safe Hands, to be bred according to the Laws of the Land, and as befits his Descent. The House was adjourned during Pleasure, and the Lords went to the Conference. And Report was made, "That the Letter delivered at the Conference from the Committee at Oxon was the Sum of that sent by the Earl Northumb'land." The Petition of Sir Thomas Cary was read; desiring "That his Petition remaining in this House, and an Answer of the Bishop of Ardagh, might be considered of by some of the Judges, and Report made to the House." Ordered, That the Report touching the Capuchins shall be made to the House on Monday next, at the Sitting of the House; and that then the Business shall be considered of. Ordered, That Mr. Peter Saltilion shall have a Pass, to go into France. "To the Right Honourable the Lords assembled in Parliament. 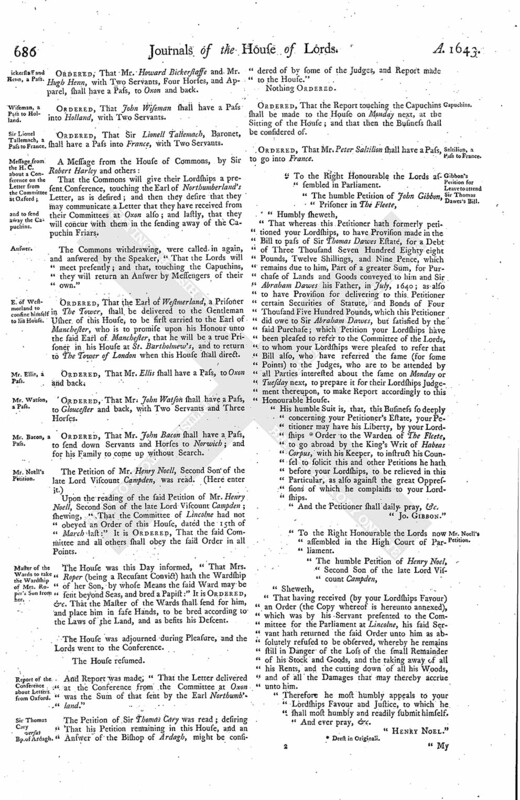 "That whereas this Petitioner hath formerly petitioned your Lordships, to have Provision made in the Bill to pass of Sir Thomas Dawes Estate, for a Debt of Three Thousand Seven Hundred Eighty eight Pounds, Twelve Shillings, and Nine Pence, which remains due to him, Part of a greater Sum, for Purchase of Lands and Goods conveyed to him and Sir Abraham Dawes his Father, in July, 1640; as also to have Provision for delivering to this Petitioner certain Securities of Statute, and Bonds of Four Thousand Five Hundred Pounds, which this Petitioner did owe to Sir Abraham Dawes, but satisfied by the said Purchase; which Petition your Lordships have been pleased to refer to the Committee of the Lords, to whom your Lordships were pleased to refer that Bill also, who have referred the same (for some Points) to the Judges, who are to be attended by all Parties interested about the same on Monday or Tuesday next, to prepare it for their Lordships Judgement thereupon, to make Report accordingly to this Honourable House. "His humble Suit is, that, this Business so deeply concerning your Petitioner's Estate, your Petitioner may have his Liberty, by your Lordships (fn. 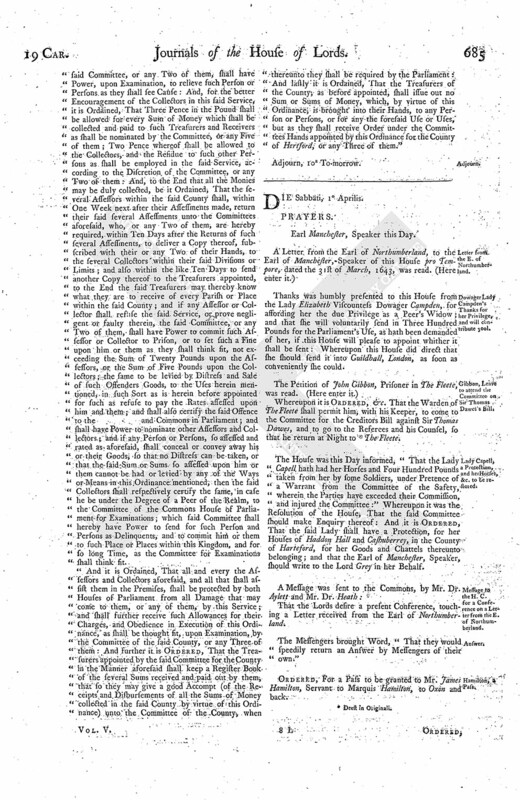 2) Order to the Warden of The Fleete, to go abroad by the King's Writ of Habeas Corpus, with his Keeper, to instruct his Counsel to solicit this and other Petitions he hath before your Lordships, to be relivered in this Particular, as also against the great Oppressions of which he complains to your Lordships. "And the Petitioner shall daily pray, &c.
"To the Right Honourable the Lords now assembled in the High Court of Parliament. "That having received (by your Lordships Favour) an Order (the Copy whereof is hereunto annexed), which was by his Servant presented to the Committee for the Parliament at Lincolne, his said Servant hath returned the said Order unto him as absolutely refused to be observed, whereby he remains still in Danger of the Loss of the small Remainder of his Stock and Goods, and the taking away of all his Rents, and the cutting down of all his Woods, and of all the Damages that may thereby accrue unto him. "Therefore he most humbly appeals to your Lordships Favour and Justice, to which he shall most humbly and readily submit himself. "After we presented to His Majesty the last Message of both Houses concerning the Cessation, some of the Time allotted for the Consideration thereof was spent (fn. 3) "